Order white oak vent covers to compliment your wood floors or trim. The wooden floor registers have an adjustable metal sliding jiffy damper for easy air flow adjustment. Drop-in oak vent covers can be used even if your floor has already been installed. The damper on the wooden floor register drops into the floor about 3/8". Purchasing an unfinished oak vent cover will allow you to stain the register to match your existing floors or wood trim. 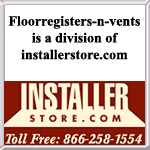 Installing you new wooden floor registers is as easy as dropping them into the floor opening and walking away. Zoroufy is known the world over for their high quality and beautiful vent covers and stair rods. 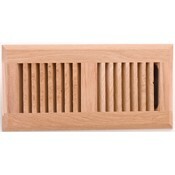 Now they are offering these white oak vent covers with the same great quality. Looking for wooden floor registers in a different wood species? We have many options to choose from. Place an order for your new white oak vent covers today and update your old ugly registers.